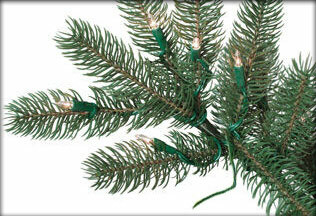 Learn How to Repair Common Defects in Christmas Lighting. Christmas light sets as well as other holiday and party lighting products are designed to be a flexible and cost effective way to bring bright colors to a Christmas tree, garland, or holiday space. They are also notorious for being unreliable and difficult for a consumer without special tools to troubleshoot when problems do occur. The following should take some of the mystery out of your Christmas light set and help you understand some easy ways to fix some of the most common issues. Some of the green “wires” aren’t actually wires at all. Occasionally we hear people noting that the “wire” doesn’t seem to have any copper in it. This may seem strange but it's true! If you read on, you’ll understand, but sometimes the “wire” that passes by a socket is there for no reason other than strain relief and aesthetics. The “wires” mentioned above (wires that aren’t wires) are why some bulb sockets actually have THREE wires attached to their bases – to bases which are bigger than the others in the strand. 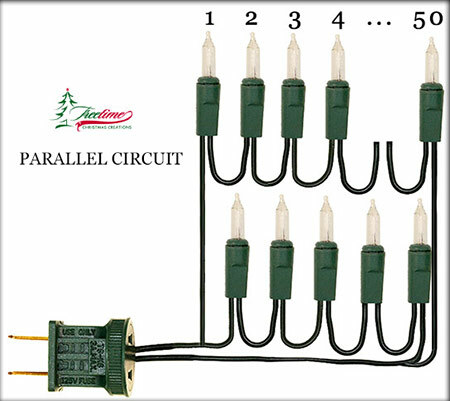 Christmas lights are wired as a “series” of lights along a single electrical path. That means that the first bulb must past electricity to the next, sequentially, from first to last in the series for ANY of them to light up. 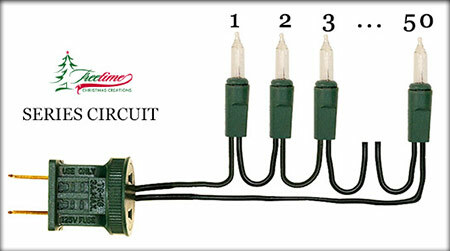 Sometimes these “series” of lights are wired in “parallel” – more than one grouping of lights attached to a single plug. There are two wires attached to the base of each bulb socket – one can be thought of as electricity “in” and the other is electricity “out”. The bulb provides the connection between the “in” and “out” wires. The filament which creates the light is the path that allows the electricity to pass through the bulb from the “in” wire to the “out” wire. When a filament burns out the path is broken – and this burned out bulb in old-style Christmas lights (not modern ones) would therefore stop the passage of electricity to the other bulbs in the system. Modern systems have a fix for this. Pretty much every modern Christmas lighting system with small Italian-style bulbs won’t fail if a bulb burns out. Don’t let any retailer make you think this is special. The reason is that each bulb actually has both a filament and a “shunt”, an alternate path for the electricity to get through the bulb. When the filament burns out, the shunt takes over and passes electricity straight through the bulb to the next one. This shunt is a wonderful thing when it works. Bulbs burn out, and despite the failure of that one bulb, the rest of the strand stays lit. However, it introduces a new problem. The filament in each light bulb burns a little bit of power. 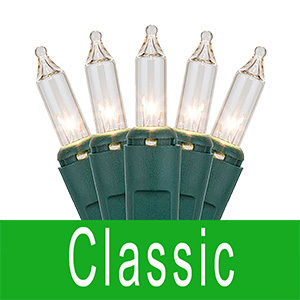 In the Treetime Classic lighting, each bulb burns about ½W. When a filament burns out, the shunt takes over the job of passing electricity from one bulb to the next – but it doesn’t dissipate any power. We won’t go into the details about how or why – or bore you with the math – but when one bulb burns out that power that had been burning in that bulb is “shared” by the rest of the bulbs. There are 49 remaining good bulbs, but each now burns just a little brighter, not enough to even notice, but just a little (2%) brighter. It is also put under 2% more strain and makes it likely to burn out faster. When a second bulb in the strand burns out, the power it was burning is also shared. This sharing pattern continues for every subsequent bulb which burns out. By the time the tenth of fifty burns out, each remaining bulb is now dissipating more than 20% more power than it is designed to handle. This causes an even higher rate of bulb failure, and eventually a situation where if even one more bulb burns out, the remaining bulbs all get pushed past a limit that they just can’t handle – and they all burn out together. This is a “Cascading Outage”. Usually if a strand has failed under these conditions, you will find that the glass of the bulb has gotten very dark from the extra heat – a clue that every bulb of that strand might be burned out. Any group of bulbs that appears to be burning very brightly is also a great clue that this is about to happen. If you see this, turn off your tree immediately and replace the burned out bulbs. The easiest problem to fix (and, believe it or not, a very common one) is a light set that isn’t plugged in to the wall – or is improperly plugged into another strand that itself might not be plugged in. Make sure that the strand you are working with really has power! The best way to know for sure is to plug the strand directly into a working wall outlet. If it won’t reach, then just temporarily run an extension cord to the lights wherever they are hung. A fuse is blown. Almost all Christmas light sets have a fuse hidden in the plug. Open the trap door and check the fuse as a first quick check. Christmas extension cords also often have these fused protections so check your extension cord as well. A bulb which has burned out and whose shunt has failed to take over properly in place of the filament. A bulb whose wire is not properly wrapped around the base of the plastic husk, causing the wire to either intermittently touch the contacts in the socket or fail altogether to touch the contacts in the socket. A bulb wire has broken off of the bulb base. A bulb that is improperly placed into its socket – twisted, not fully inserted, etc. A wire that has been pulled from its proper location in the socket – causing it to not be in position to contact a properly inserted bulb. So, how do you fix these problems when they occur? The only way to fix a Cascading Outage is to replace the bulbs – all of them. This seems like a huge task, but it really isn’t that difficult. It shouldn’t take more than about ten or fifteen minutes to replace the bulbs in a single 50-bulb strand of lights. Spare bulbs for your artificial Christmas tree or wreath/garland are available on our website, click here. Unplug the strand of lights from the power source (the wall outlet or the point in the tree where it attaches to the others which might be lit). Identify the first bulb in the strand by following the wire from its plug along the length of the strand until you have come to the first bulb. 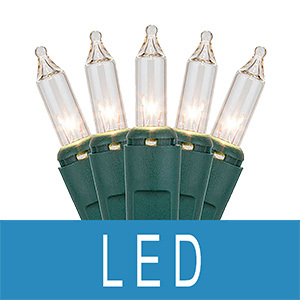 It is easier to keep track of which bulbs are replaced if you start at one end or the other. Remove the first bulb and replace it with a fresh one. Check each bulb before you insert it into the socket to ensure that the wires protruding from the base of the bulb are wrapped properly around the base (see pictures for reference). Do this one at a time so you don’t lose track of where you are – and unintentionally leave a socket without a bulb. Removing bulbs: The bulb itself is just the glass globe with the filament and shunt enclosed and inserted into the husk (or bulb base). It is really this base which is inserted into and removed from the socket with the globe of the bulb attached. Be careful NOT to just grab the globe and pull. Instead use your fingernails or an appropriate tool to separate the rim of the bulb base from the socket into which it has been inserted. Pull the bulb base from the socket and the globe will come with it. If you do it the other way, you may pull the globe from the base and leave the bulb base stuck in the socket. Work your way along the length of the strand until all fifty bulbs are replaced. 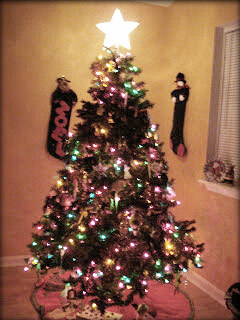 Plug the strand back into the wall outlet or extension cord within the tree and apply power. If a bulb is burned out and for some reason the shunt fails to take over, you can fix this defect with a commonly available tool called the “Lightkeeper Pro”. One of its features is the ability to engage shunts that have failed to engage. If you have one of these tools, give it a shot. It’s a great first line of defense. It doesn’t fix every single shunt failure, but works on many and can be a time-saver if this is the only failure mode. If you don’t have a Lightkeeper Pro or if it has failed to fix you problem, then the next step is to use what we at Treetime call the “Leapfrog” technique. If your problem is caused by an issue with a single bulb failure of any type, then this technique, followed carefully, will ALWAYS fix the problem. It may seem tedious, but it is actually straight forward and simple to do. It takes only about ten or fifteen minutes – so don’t spend hours getting frustrated about your lights. It helps to have a working strand of lights nearby (or a Lightkeeper Pro, which can also be used to check individual bulbs) where you can confirm that each bulb is functional. Start out by finding a known-good bulb, one that you have checked in another strand of lights or with a Lightkeeper Pro. Make sure that the failed strand of lights is plugged into a working power source (outlet or extension cord) and that the fuses are all OK. Remove the first non-working bulb. Take a look at the base of the known-good bulb and ensure that the wires protruding from the base are still properly bent up the sides of the bulb. Insert the bulb into the empty light socket. If the strand turns on, then the bulb in your hand is the bad bulb. If the strand does not turn on, then the bulb in your hand may be either good or bad – but you need to know for sure. Check it by placing it into a socket on a strand of lights that is known to work or by using a Lightkeeper Pro. If that bulb confirms to be a good bulb, then you can use it as your known-good bulb for checking the next position. If the bulb that you removed from the previous position cannot light a good strand and/or cannot be confirmed to be good with a Lightkeeper Pro, then find an alternative known-good bulb from another strand of lights or from a package of spare bulbs. Follow the wire from the last bulb that you replaced in the defective strand and find the next bulb along its length. Remove that bulb. As before, check the wires on the good bulb that you have set aside, and insert it in the socket position that you have just opened. If the strand turns on, then the bulb in your hand is defective. If it does not, then go again to the previous step. Keep in mind that there may, on some occasions, be multiple bulbs in a strand which have failed. By continuing along this sequence of checking and confirming each bulb, you will find each bulb that has a problem, until the strand again begins to work. What if nothing else works? What to do next? 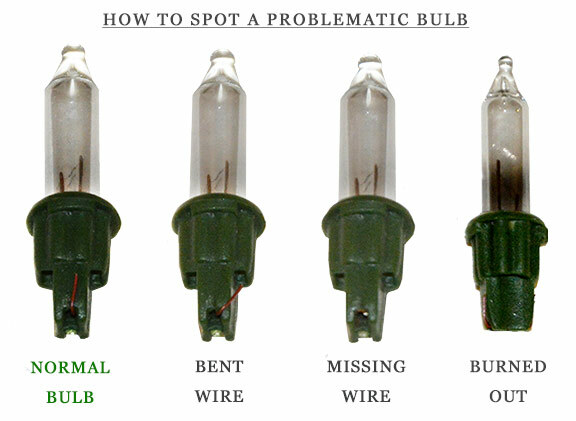 IF, after you have carefully completed the Leapfrog technique for each bulb in the strand, the strand still will not light, then there is likely something wrong with one of the contacts in the base of one of the bulb sockets, something wrong with the attachment of a wire to a socket, or something wrong with the fuse. These other defects can be more difficult for a consumer to troubleshoot, but we have more advanced tools at Treetime which allow us to find and repair them in almost every case. If that is your situation, then we can certainly still help! In the midst of the busiest part of our Christmas selling season we are quite resource limited and therefore unlikely to be able to make such repairs in a timely fashion. As such, if you’ve exhausted all of the options above and still have lights out, then take a strand and lay it into the area where your tree is dark and enjoy your tree for the season. When the Christmas season has come to a close and you take down your tree, give us a call. We’ll recommend that you bring or send us the section for us to evaluate and repair. DON’T just put your tree back into storage with the intent of doing it earlier next year! We all get busy, and invariably customers get to the next season and find that they forgot all about it – only to again have the same frustration.